I’ll Nurse You Back to Health, Rafik! For this manicure, I started off with two coat of Color Club’s Smooth Operator Ridge Filling Base Coat. I then used two coats of China Glaze Snow as a base on each nail. I used China Glaze Ruby Deer for the heart monitor and the cross. I used a mix of Color Club Best Dressed List with either Snow or or Sinful Colors Black on Black for the bandaid/ bandaid shading. I used a mix of OPI’s Chop-Sticking To My Story and Claire’s Neon Orange for the pill bottle, with details/label/cap in Snow and Black on Black. I then used Black on Black for the cross details and the stethoscope. I topped off with one coat of Color Club’s 0-60 Speedy Top Coat. Overall, I really enjoyed this design. I feel awful that Rafik is sick though. He’s great at sweating out illnesses and hates to take medicine, so he has to deal with me, a former pharmacy employee, trying to get him to take a bunch of stuff every few minutes. He’s right though- he’ll get better faster without most of it. I was going for more of a cartoony look with this manicure and I hope you liked it! This entry was posted in Nail Art and tagged black, brown, China Glaze, Claires, Color Club, creme, OPI, orange, red, Sinful Colors, taupe, white by Tara. Bookmark the permalink. This is really cute, I hope Rafik gets better soon, and my little 10 month old niece she has a cold. :o( I like the heart monitor too it is kinda cool. Very cute nails! 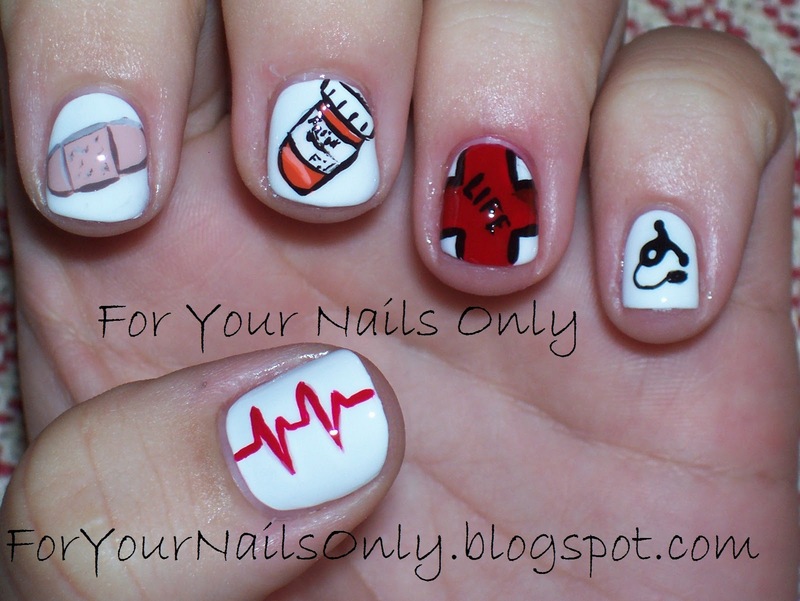 I will just consider them doctor nails as well, haha. Maybe you should do some scientist nails at some point! Beaker, pipets, um… cell culture flasks? I don't know, you are the creative one. Hope Rafik feels better soon! Heart monitor for the win! Now I am inspired to do the heart monitor thing but with black and green like the monitor actually shows in the hospital room…. hmmm. This is amazing!! I will definitely try it. Hope Rafik gets well soon!! aww! I love the band aid! I am in love with the Heart Monitor design! MUST. STEAL.